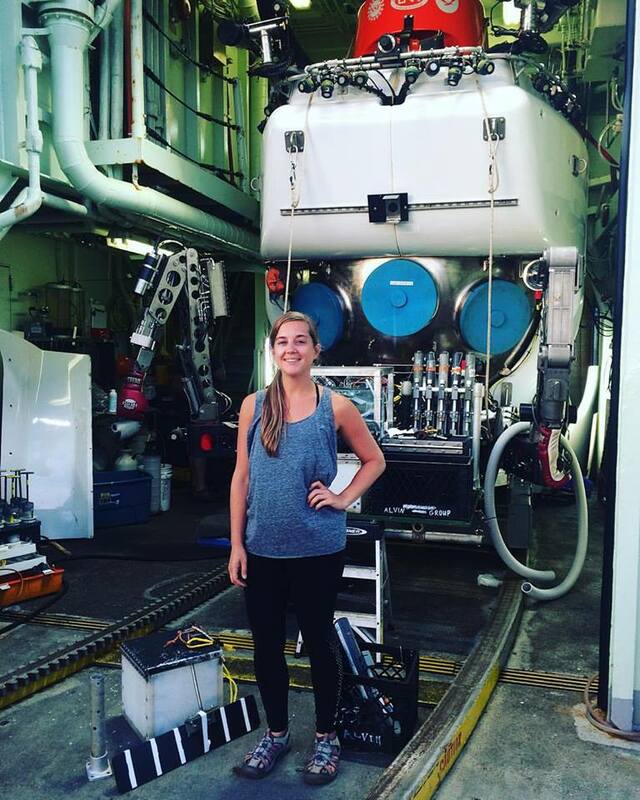 Katlin Bowman received her Ph.D. in Environmental Sciences from Wright State University in 2014 and now works at the University of California, Santa Cruz as a Postdoctoral Research Scholar. She is an avid hiker, traveler, and writer, and a past 6-year participant of the Ohio State Science Fair. 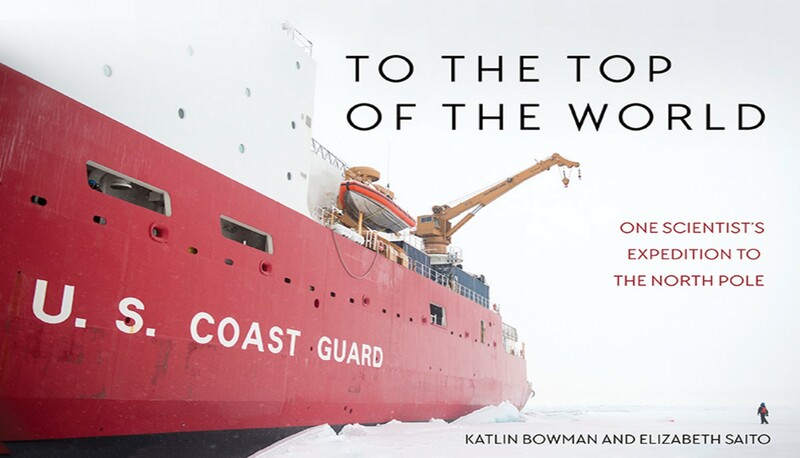 I’m excited to announce the publication of “To the Top of the World: One Scientist Expedition to the North Pole.” This young adult book is about the 2015 U.S. GEOTACES expedition to the Arctic Ocean, featuring stories and photographs from this blog. Check out our website http://www.healycruisebook.com/ to order online ($14), and read sample pages from the book. All proceeds go to charities described on the website. Thanks for your support! This summer I spent an afternoon at the bottom of the ocean, 1,260 feet below the surface in a tiny metal ball filled with computer boards and switches. At the Alvin pre-dive briefing I learned what to do in the event that the solo pilot onboard became incapacitated; flip six silver switches to drop weights and surface, use sound transmission to radio for help, open two blue valves to send oxygen to the emergency breathing apparatus. But these life or death scenarios were absent from my conscience as I climbed into the submarine and watched the metal hatch cinch shut. I settled my mind for the ride of a lifetime, to the deep, dark, bottom of the ocean. Alvin is one of the world’s first human operated deep ocean submersibles. Since its first launch in 1964 the vehicle has undergone multiple renovations to fit the needs and demands of modern science. Giant robot arms and vacuum tubes allow scientists to collect sediment, water, rock, and animals from 4,500 meters deep – that’s about 2.7 miles below the surface. Once myself, pilot Bob Waters, and dive partner Colleen Hoffman were sealed inside the sub, Alvin was lifted off the deck of the R/V Atlantis and lowered into the ocean. Two support swimmers sit on top of the sub to detach lines from the ship and do a final safety check in the water. These swimmers wear nothing but a bathing suit, snorkel mask, and fins – a stark contrast to the steel toe boots and life vests required on deck. With the safety check completed we began our decent. Hundreds of zooplankton, tiny clear organisms of all shapes and sizes, swarmed around the sub. As we lowered beyond the reach of sunlight, the darkness of the deep ocean enveloped the sub revealing a dazzling display of bioluminescence. Everywhere I looked there were tiny flashes of light, like fireflies in the night’s sky. 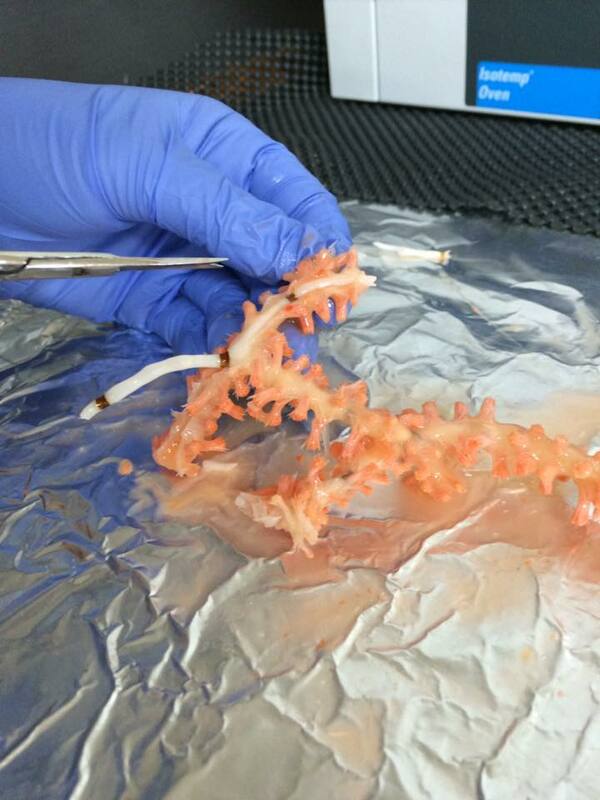 Extracting the skeleton of a bamboo coral for geochemical analysis. At the seafloor we switched on the lights and got to work. I was after a deep sea coral, amazing creatures that thrive in cold dark water and live for hundreds to thousands of years. These coral incorporate carbon and mercury from seawater into their skeletons, and we can learn a lot about the history of the ocean by studying these elements. Four hours later with our science objectives completed, we ascended to the surface and Alvin was craned backed onto the ship. Check out this video to learn more about Alvin and watch me climb into the sub- make sure you watch to the end to see the traditional first dive ice dunk! Check out this great news segment by Florida International University highlighting our 2015 Arctic GEOTRACES expedition! Now that I’m back on land with high speed internet I wanted to share a couple of short videos of the ship moving through ice and the Bering Sea. The “Seal’s eye view” is from Polar Trec teacher Bill Schmoker’s collection, check out his site for more pictures and videos! 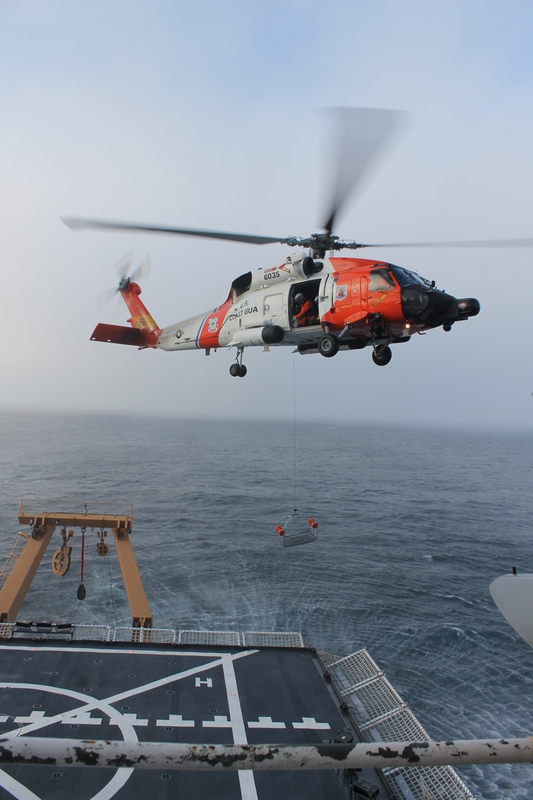 On Sunday October 11 the USCGC Healy arrived in Dutch Harbor, Alaska successfully completing the U.S. GEOTRACES Arctic expedition. As we approached Dutch Harbor Captain Jason Hamilton gathered the science party and crew together for final remarks. He thanked everyone onboard for a successful mission, congratulated us for being part of the United States’ first solo mission to the North Pole on a surface vessel, and for working together through 64 days at sea. Scientifically we accomplished ambitious goals to create one of the most unique chemical datasets of the Arctic Ocean. We were able to capture multiple points in the annual cycle of Arctic ice from late summer thawing, to thick multi-year ice at the North Pole, and early fall re-freezing. This data is vital to our understanding of how decreasing ice cover and thickness in the Arctic Ocean will change the chemistry and ecosystem dynamics of the basin in the near future. Part of our cruise transect repeated hydrography stations that were occupied by previous missions in 1994, and 2005. Preliminary results show what we expected – the mixed layer at these locations is warmer and less saline due to melting ice over the past 20 years. NASA has used satellites to monitor sea ice change since 1978 and now oceanographers are accumulating enough data to piece together how these changes are affecting the Arctic Ocean. For many of the elements measured by the U.S. GEOTRACES program (i.e. mercury), there is no historical data for comparison; this is time zero for ocean chemistry in the Arctic and it could not have come at a more pivotal time. Temperatures in the Arctic are rising faster than anywhere else on the planet. The paramount of stepping off the ship at the North Pole this September was not that we were part of a small group of people to reach the top of the world, but that within our lifetime future explorers could be sailing through open water with no summer ice to walk on. Two months is a long time to be at sea but we were rewarded on this trip with many once in a lifetime experiences (polar bears, northern lights, pictures with Santa at the North Pole to name a few!). I feel very lucky to have stumbled onto this career path and each adventure motivates me to work harder to keep moving forward with my work. What’s next: After a few days relaxing in Dutch Harbor (and mingling with the Discovery Channel’s Deadliest Catch crew – it’s crabbing season!) the science party made their way home and the Coast Guard began their transit back to the Healy’s base port in Seattle, WA. The Healy will stop in Nome, Alaska to pick up family members who will sail the last few days of the transit and catch up with their loved ones. In November scientists will travel to Seattle to collect gear and samples, and then the work continues! It will take 2-3 years to analyze all of the samples that were collected on board, to interpret our results, and write manuscripts. I would like to thank you for reading my blog this summer and taking an interest in the Arctic Ocean. A special thanks to Abigail Doyle who managed my postings above 75 N when I was without internet. I will continue to post sporadically between expeditions, please click the “follow” link if you would like to receive email updates. Stay curious! “A mind that is stretched by a new experience can never go back to its old dimensions.” -Oliver Wendell Holmes, Jr. Moments ago we crossed latitudinal line 66 °N officially exiting the Arctic. 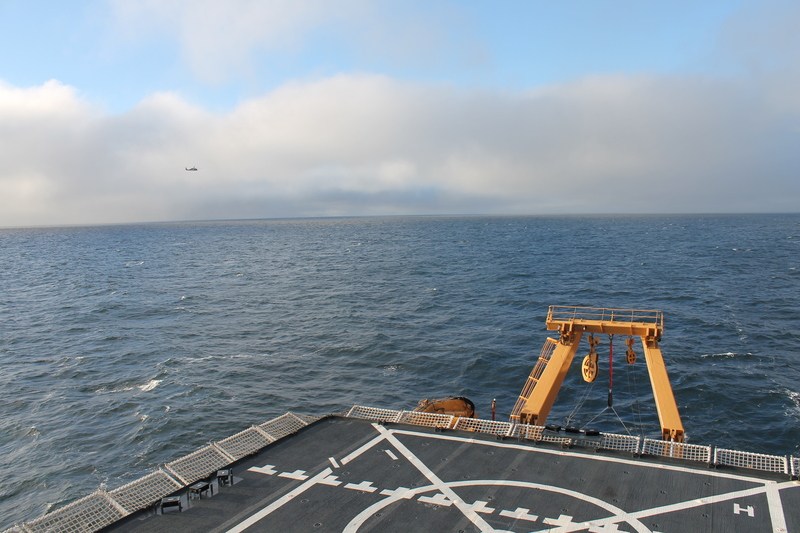 We intended to sample two more stations in the Bering Strait but all further science operations have been canceled due to rough seas. We will reach the Diomede Islands sometime this afternoon and enter port in Dutch Harbor on the morning of October 12. For now we are packing up labs, organizing samples, and enjoying our last few days at sea. 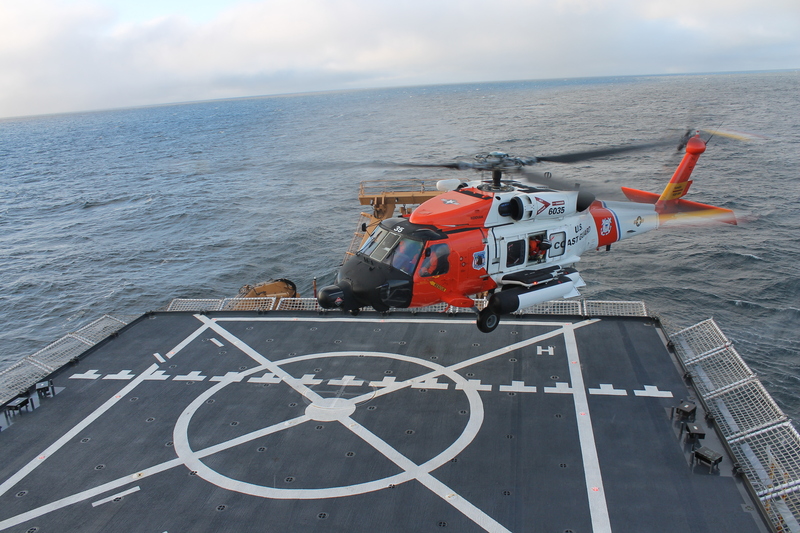 Earlier this week, two government officials arrived via helicopter from Barrow, Alaska to observe the Healy’s underway operations through to Dutch Harbor. Wearing flight helmets with ear and eye protection we were able to stand on deck to watch the craft land and practice lowering a man basket before returning to land. The following morning the helicopter was back for a medevac flight, transporting an ill crew member back to land for emergency medical attention. Medical emergencies on a ship can be dangerous, there are two medical officers on board the Healy but their resources are limited at-sea. The Polarstern (German GEOTRACES) also experienced a medical emergency in the Arctic forcing the ship to change course and head for land, both patients we have heard, are doing well. Welcome to hginthesea! “Hg” is the chemical symbol for mercury, which is an environmental contaminant and naturally occurring metal found throughout the ocean. This blog is a chronicle of research cruises that study marine chemistry, and includes live updates from sea. Research expeditions are funded by the National Science Foundation through the U.S. GEOTRACES program (www.geotraces.org). Stay tuned for my next trip to the Arctic Ocean (August-October 2015) and check out my most recent expeditions in the North Atlantic and Eastern Pacific Oceans. Click the "follow" button below for email updates, and thanks for stopping by!